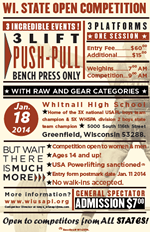 The WI State Open Powerlifting Competition will be on Saturday, January 18th at Whitnall High School. This is a sanctioned USAPL contest. As in years past, there will be three-lift and bench only, and new this year is a push-pull. The event will have three platforms – one session. Divisions include raw, geared, men, women, open, teen, and masters. Registration will be limited to the first 115 entry forms received. Competition open to all states. Click on the image to the right for the printable poster! Fill out the online registration form (update 1/12/14: registration is now closed). Within 24 hours of submitting the online registration you should receive a confirmation email, please sign the “release from liability” and the “certification for competitors,” include your entry fee payment by writing out a check to Whitnall High School and mail to: T. Lambeth, 5848 Middle Rd, Racine WI 53402. The postmark date for the the registration form and the payment is January 11, 2014. No new entries will be accepted the day of competition. No refunds once monies are received. The initial entry fee is $60 with an additional $15 for each added division/event. Contest t-shirts are available for pre-order when you send in your entry form. $15 each. Proof of current USAPL membership will be done at registration morning of contest. Purchase on-line at the USAPL website for $45, if purchased day of contest will be $5 more. Bring this and a government issued photo ID as both will be asked for by the referees. Local hotel suggestions will be provided soon. Be sure to look at the USAPL rulebook before the competition. Personal equipment (what to wear on the platform) starts on page 16 and rules of performance (what the refs will be looking at) start on page 23. The USAPL is the number 1 choice for drug-free lifting, at all sanctioned contests 10% of the competitors are drug-tested. Flight information will be posted the week of the contest (cannot post this before receiving the January 11th or earlier postmarked mail). The list of competitors will be posted weekly and then daily in the last two weeks before the competition. If you have questions regarding the meet or are unable to use the online registration form please contact the WI USAPL State Chair Tonya Lambeth (email or 262-752-0597). Congratulations to everyone who competed at the 25th Annual Hudson Natural Open. It was a great meet with several American records being broken! Thank you again to the Cain’s for another well run and fun meet. Below is the updated roster for the 25th Hudson Natural Open. The meet is coming up soon, November 2nd! Below is the complete roster for the 25th Hudson Natural Open. All 60 spots have already been filled. Good luck to the competitors! Below is the updated roster for the 25th Hudson Natural Open as of October 10th, 2013. Only 9 spots left, 2 less than the previous post! The registration deadline is October 19th or once 60 spots have been filled.